Most of us have lived in or owned a home where at one point that dreaded water stain just appeared on the ceiling. Out of nowhere – there it is. It's never anything we're proud of. Actually most of the time we just ignore it. Well, it turns out that is one of the worst things to do! Ignoring a water stain is just tempting fate. Not only can the stain potentially get worse, but you run the risk of structural or electrical damage. And because we don't want to have to tell you "I told you so", well, keep reading. The other thing NOT to do is to immediately cover up the stain. Again, tempting fate here. 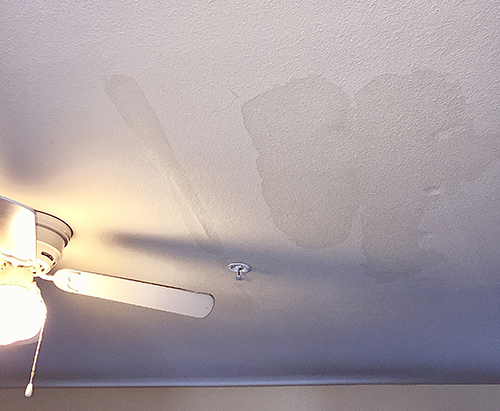 Out of sight out of mind won't save you when your ceiling crashes to your floor due to built-up water from problems you didn't fix when you first spotted the stain. Moral of the story: find the problem, fix it, then cover it. The source of the stain is most likely from a leak and it's usually from whatever is right above the stain. Other possibilities are the roof, a heating appliance, or faulty plumbing where water seeped through the ceiling and evaporated—leaving you with an unsightly ring of discolored mineral deposits. Old and crumbling shingles and weakened seals around the roof vents can allow water from rain or snow to enter your home. 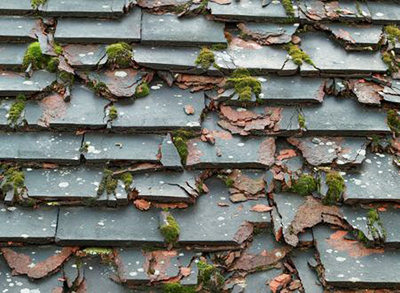 If you spot this on your roof, make repairs immediately and also check the weatherproofing material that was installed on the roof; when that is compromised, it can also allow water to seep through. If your caulking, shower pan, radiator or pipes start to deteriorate, it can be a major problem. Caulking inside a shower, for instance, should last about ten years. If you've owned your home longer than that and it still has the original caulking, you may want to go to your local hardware store right now and pick some up. Walk the walk–caulk the caulk! Regarding shower pans, plastic ones will deteriorate faster than concrete ones. To verify if your shower pan is the cause of your leak, check the subfloor underneath. This is the fun part – crawl underneath your home and check the floor joists. Major leaks will be visible because they will spread outward and soak adjoining areas, such as walls on an adjacent room, or drip down to the next level. Depending on the radiator you have, the leak could be coming from a valve, a fitting, vents, or rusted and worn joints. Also, check your pipes above the stain. It’s not uncommon for water to run along rafters or piping before dropping onto your ceiling, concealing the true source of the problem. Once you discover the cause of the leak, you can decide to make the necessary repairs yourself, or you may choose to enlist help from a professional roofer, HVAC professional, or plumber as needed. Now that you have fixed the underlying problem that caused the stain, you are ready to begin cleaning and repairing the ceiling. Make a mild bleach cleaner at home (one cup of bleach to three cups of water) that will help fade the stain and remove any remaining grease, mildew, dirt, and dust. Place an old sheet or a drop cloth below the spot, gather some gloves and protective eye gear, get your heavy duty sponge ready and begin wiping down the affected area with your bleach solution. Rinse the area with some water applied with a spray bottle, then wipe it clean with a dry cloth. Once the area is dry, place painters tape around any areas you don't want to get paint on. Next apply an oil-based, mold-resistant, stain-blocking primer rather than a latex based paint, matching the color as close as you can, to the ceiling. If you have a smooth ceiling, you can roll the paint on with a paint roller. However, if your ceiling is textured, it may be easier to spray it on. After the area is primed, paint over it with either a latex or oil-based paint (latex does tend to dry faster). 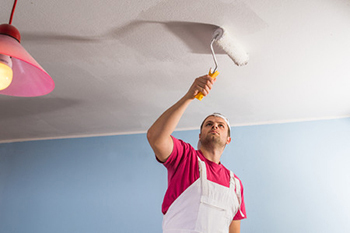 Two coats should be enough to bring your ceiling back to normal. Now that you have learned what to do and what not to do when it comes to frightful water stains, hopefully, they won't be so frightful anymore!